We offer a full range of pressure and vacuum calibration services to ensure your gauges perform well in industrial, medical, and scientific applications. Calibration is a process whereby technicians compare measurements taken from gauges in your facility against those from factory-standard gauges with known accuracy, fixing problems as necessary. Routine calibration ensures that your gauges are up to standard and within allowable tolerances. Regularly calibrating your equipment also results in improved workplace and employee safety along with better machine performance. Adhering to these standards results in reliable systems and safe employees. In addition, we issue a Certificate of Calibration at the end of each completed job, and all certificates are traceable to the NIST. Pressure gauges appear in factories, laboratories, and the field. Their high prevalence makes it easy to delay or overlook needed repairs, which can lead to equipment failure. While some of these factors are endemic to a given application, others can be mitigated or corrected by trained technicians. 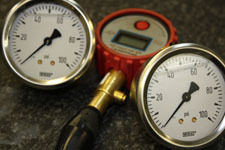 At Garber, we can calibrate equipment that handles up to 10,000 psi. We offer calibration services both on site and in house in our calibration lab, and we offer regional pickup and delivery for in-house projects. We perform most jobs within five days of the initial order. Although determining a proper calibration test schedule depends on many factors, most gauges require more maintenance as frequency and intensity their uses rise. At Garber, we perform vacuum calibration services for gauges that handle as much as 25 Hg. As with our pressure calibration services, we provide vacuum calibration both on site and at our facility. During vacuum calibration, we use computerized pressure modules that can calculate negative pressure capacities. We set a known standard to each pressure point, and then inspect and compare each pressure point with the test gauge’s readings. This process identifies any deviations from the standard, allowing us to pinpoint where in the system the error occurred. Each instrument typically receives a five-point vacuum calibration, and we compare the test instrument with the standard instrument at every 20 percent of capacity. We also perform more precise 10-point calibrations if needed, during which we compare the instruments at every 10 percent of capacity. At Garber Metrology, we offer complete pressure and vacuum inspection and calibration services for businesses across the Mid-Atlantic region. Working with us will give you peace of mind knowing your employees and your facilities remain safe. If you would like to learn more about our pressure and vacuum calibration services, contact us today.